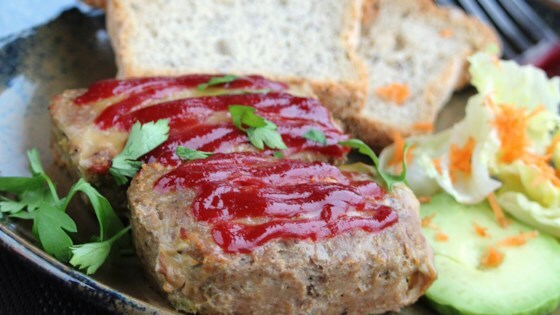 "It's a pork sausage version of my favorite meatloaf recipe and it's awesome with pancakes, omelets, French toast and on a Brunch Burger." Place pork sausage, bread crumbs, onion, egg, and shallot in a large bowl. Season with salt and pepper. Pour in buttermilk; mix thoroughly. Pat mixture gently into the prepared loaf pan; top with ketchup. Bake in the preheated oven until edges are bubbling, about 45 minutes. An instant-read thermometer inserted into the center should read at least 160 degrees F (71 degrees C). Cool for 5 minutes before slicing. If you have leftovers, slice and wrap and place in freezer for future weekend brunches. Reheat in a grill pan. You can use panko bread crumbs in this recipe. What a fun addition to your brunch table. I used turkey sausage and topped it with Sriracha ketchup and cheese using individual loaf pans. Thank you for the recipe.